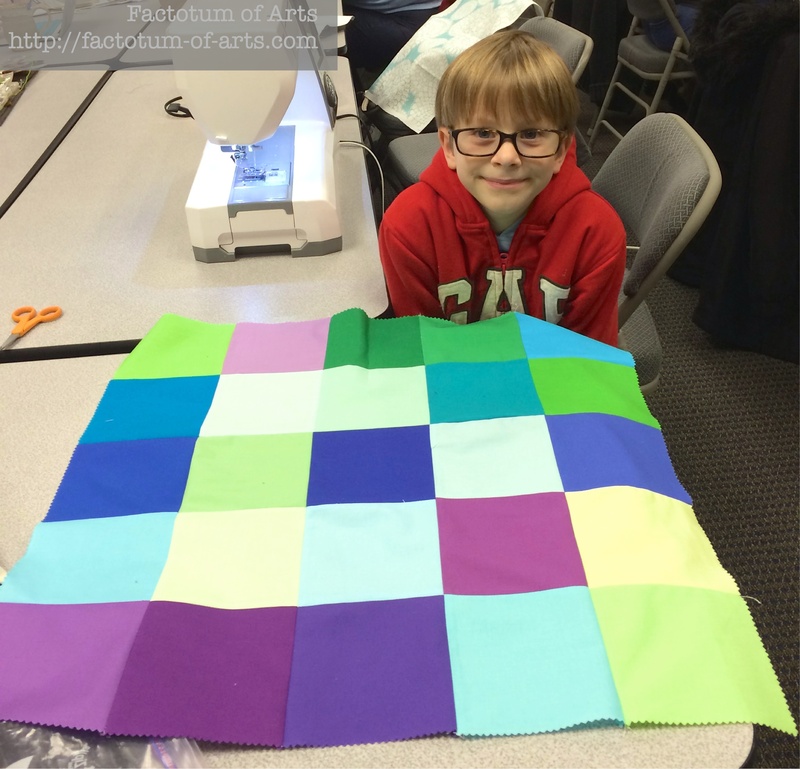 My son (7) and I attended Spoonflower’s sew together, “Pins and Needles” this week (3rd Tuesday of every month), where we both finished our quilt tops. He was so proud of his patchwork top. He picked out the Kona solid squares from a charm pack and organized the placement randomly. He sewed all the pieces and rows together, and just needed a little help with the pinning and pressing. This is going to be turned into a patchwork pillow for his friend’s Christmas present. For my finish, I finished up the Ranger’s Station quilt top pattern. The quilt top is made with Oakshott Cottons. 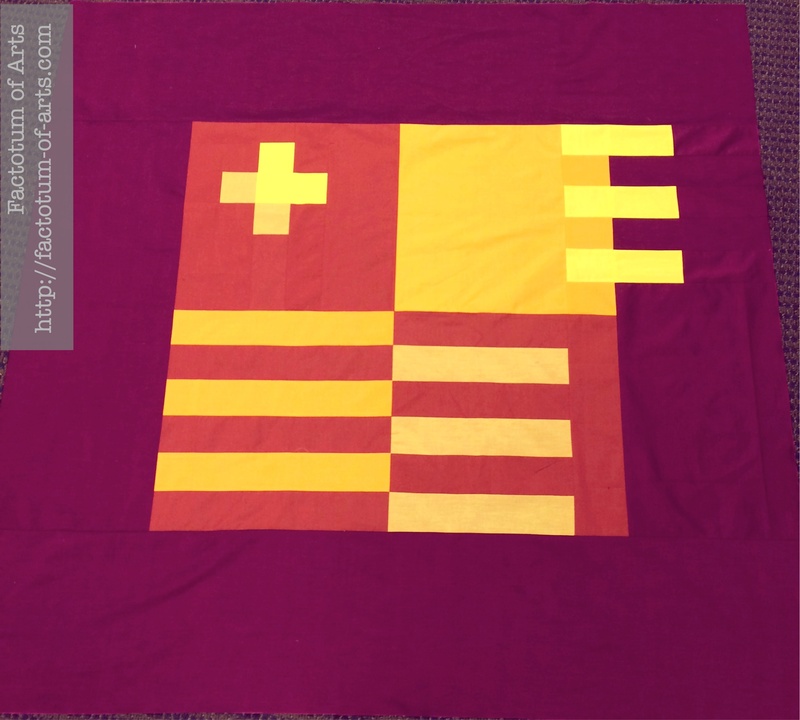 The middle blocks use colors all out of the autumn bundle; and then the border is Lipari (08). I have had a hard time getting the colors to show up right in the photos. This is the closest colorings above, but they are so much brighter especially with the light on them. 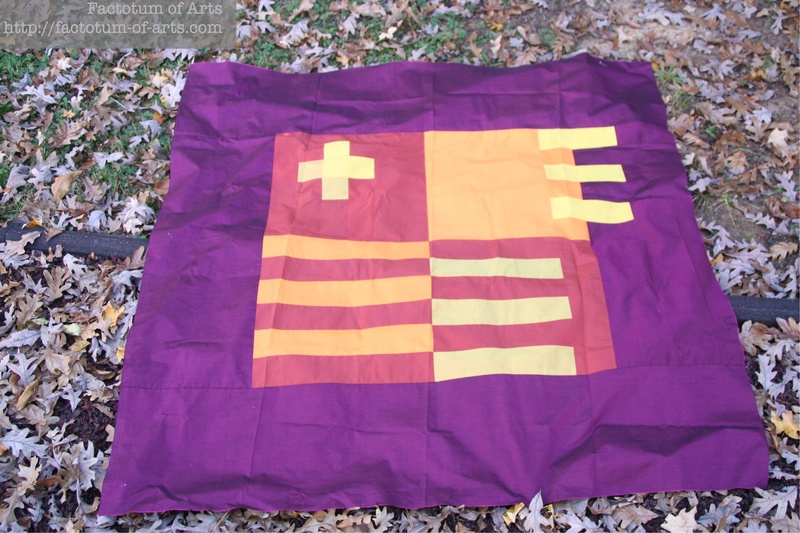 To show you how hard it is to photograph the color’s….this is the same quilt in the shade. Anyway, the pattern for this will be coming out the end of December, so keep an eye out for it in Craftsy store. Linking up our projects with Amanda Jean @ Crazy Mom Quilts for Finish it up Friday. This entry was posted in Uncategorized and tagged Finish it up Friday, Oakshott Cottons, Patchwork pillow, Rangers Station on November 22, 2014 by mlwilkie. I have to say, I love what he did and the fact that you encourage him!! Your son looks proud and proud he should be!! This little guy did a wonderful job!! Great combination of colors!! Way to go!! Love your Oakshott quilt in closet as well as in shade version! These two pictures could very well be taken from Josef Albers’ “Interaction of Color” to illustrate the relativity of our color perception. Oh, how I feel your pain re: photographing quilts. But I can also relate to the joy of watching your son sew. Mine is 5. The funny thing is, he likes to “draw” with my sewing machine; he’s not interested in constructing anything. (His favorite creation is something he claims is the picture of a surfboarding bird!) Congratulations on both of your quilt-top finishes! Your son looks quite pleased! I bet his friend will be delighted with the handmade pillow. Your quilt top is so pretty, I need more oakshot cottons in my life! So he’s a cutie! So proud of his work, and he should be! Your son’s cushion top is going to be great – looks like he’s doing a pretty good job! It’s pretty amazing how different the colours look in those two photos of the new quilt. It looks gorgeous, in any case!